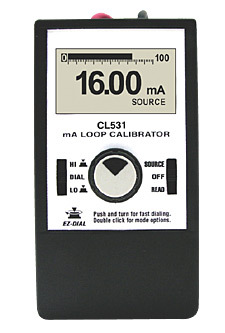 OMEGA’s CL531 is a milliamp calibrator combines all the features required to check, calibrate, and troubleshoot 4 to 20 mA process control loops in one easy-to-use instrument. It features a 4 digit display and bar graph for quick reference. The high contrast graphic display is viewable in most lighting conditions and angles. Output is easily adjusted by the easy dial knob. 참고: Comes complete with test leads, operator’s manual, 2 “AA” alkaline batteries and NIST calibration certificate.